In this collection we’re gathered fresh Illustrator CS6 and Illustrator CC tutorials which can help to create Vector Graphics in Adobe Illustrator. I hope! New illustrator tutorials shows how to drawing and making of vector graphics. these illustrator tutorials can enhance you’r illustration skills and improve the quality of your works. The tutorial should also provide an insight into the thought process that goes into creating distinctive work to a brief. He’ll take you through how best to trace over a photo to get a vector drawing in half the time and with amazing results – then how to apply flourishes and grunge, then colour it ready to use as a screenprint or T-shirt. The tutorial shows how does a colorful dimensional lion head appear on the warm sand yellow background. The way is to add color onto the original lion head and deal with details time and time again. In this tutorial, you will learn how to create a koala climbing on a tree. It’s an easy, fun tutorial for those who’ve just started to learn Adobe Illustrator. In this tutorial, You’ll learn how to use the Mesh tool with gradients to manipulate how they flow – for example, to wrap them around the contours of a face for a 3D look. You’ll also learn many other techniques to make a montage of unusual elements look right together. In this tutorial, I will show you the easiest way to draw the hair, but if you are already pretty good at this and want to learn more, please check out this special tutorial. 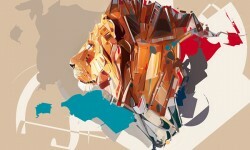 The best creatives who make the most stunning vectors are those with a sharp eye for detail. Having a hawk’s eye (both the animal and the Marvel character) that can pick up on subtle changes in line work and curves of a shape is pretty crucial for creating awesome illustrations. For this Design Tip of the Week, we’re going to focus on curves. A glass of cold, fresh milk and a crispy cookie with chocolate chip—many of us have loved this yummy snack since childhood! Let’s refresh these sweet memories and create a realistic glass of milk and a textured oatmeal cookie with chocolate chips, using Adobe Illustrator’s basic shapes, Distort and Transform effects, and gradients to achieve a glossy and three-dimensional look. In the following steps you will learn how to create a detailed illustration of a double-decker bus in Adobe Illustrator. In this short tutorial, will show you how to create your own furry cat portrait based on a stock image. Using Adobe Illustrator, you’ll learn the theory and process of creating detailed fur, as well as how to create enchanting cat eyes and many other tips and tricks. You learn how to define certain features not with lines but with shades shapes and shadows. We’ll also learn how certain tools and effects within Illustrator make our job easier and give us the ability to edit them as much as we want. This tutorial show you how to create a portrait from a stock image, using summer colours, in Adobe Illustrator. In this tutorial we’ll create a set of flat animals made from simple shapes in Adobe Illustrator CC. Using rectangles, triangles, circles, Live Corners, and a few squiggly lines, we’ll create a whole zoo of creatures ready for the Pattern Options panel and various printed products. Creating a grainy texture vector is great for retro illustrations, typography, and logos. Alternatively, you can incorporate these effects into compelling new styles. In this tutorial we’ll go through the process of creating a lighthouse icon in a trendy flat style using Affinity Designer. We’ll be using simple shapes, such as rectangles and ellipses, and manipulating them with Boolean Operations to transform the shapes. Let’s get inspired and create a cozy autumn illustration with a cute girl in gumboots, holding an umbrella. We’ll be using various drawing tools of Affinity Designer and decorate our image with custom patterns. In this Illustrator tutorial we’ll go through the step-by-step process to make a cute little cat in watercolor style. The tutorial will mostly rely on the use of the Pencil Tool and some other easy functions that Adobe Illustrator has to offer. In this tutorial, Brazilian designer Breno Bitencourt shows you step-by-step how to create a stylish low-poly portrait in Illustrator and Photoshop. In this tutorial, I’ll be showing you how to render your own little mascot, using an awesome sketch created by the ever-creative Monika Zagrobelna. This was a collaborative project, so you’ll want to see how this little guy came into existence. Vector illustration can produce beautifully clean, precise artwork, but the results can also be a bit soulless. Here Mark Oliver creates those clean, precise shapes and then ‘grubbies’ them up for a more organic retro look. In the process of implementing the thirty steps, we’ll be using Ellipse, Rectangle and Rounded Rectangle Tool, Roughen Effect, Pucker and Bloat, Pathfinder Panel and Clipping Mask. Follow this tutorial and learn how to create a bagel sandwich icon in Adobe Illustrator. At the beginning you will create the two bagel pieces, and then you will draw all the ingredients for the sandwich: pieces of lettuce, a slice of cheese and a slice of ham. When illustrating a scene, it is important to think about several factors including lighting, depth of field, and color. You can also enhance your illustration by conveying an emotional message. In this tutorial, Therese Larsson will show you how to create a heart-warming wildlife illustration using a variety of digital illustration techniques. Let’s get started!